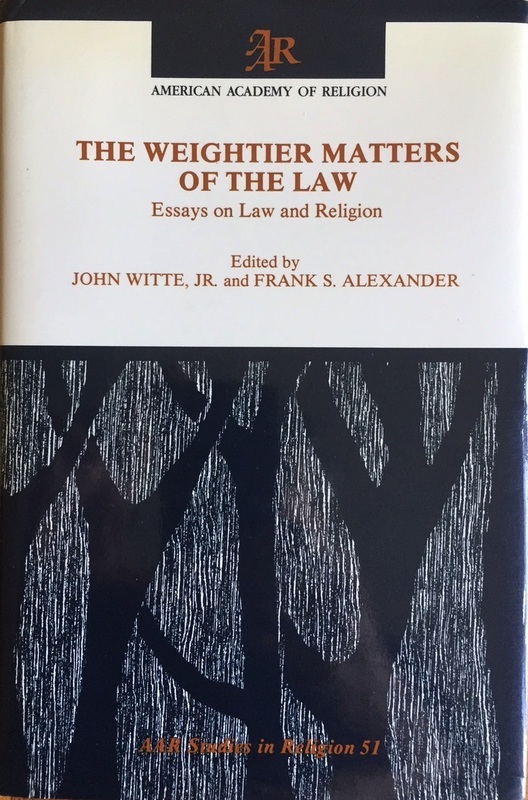 Book: The Weightier Matters of the Law - John Witte, Jr. This volume is comprised of a collection of essays offered as a tribute to Harold J. Berman for his path-breaking work in the field of law and religion. The first group of essays treats various historical aspects of the interaction of law and religion. Brian Tierney offers critical appraisal of Michel Villey's thesis that the idea of subjective rights was first developed by the fourteenth century nominalist philosopher William Ockham and demonstrates that the idea is already evident in the work of earlier writers, notably Johannes Monachus and John Peter Olivi. Charles Donahue describes a number of plea rolls of the ecclesiastical Court of Canterbury in the later thirteenth century, analyzes the subject matter and disposition of cases summarized in the rolls of the English royal courts. John Witte describes how the Lutheran reformers displaced the Roman Catholic sacramental concept of marriage with a social concept of marriage and transformed the laws of marital consent, impediments and divorce. Douglas Sturm analyzes the development of Gerrard Winstanley's unique communal concept of natural law and its influence on the beliefs and communitarian practices and proposals of the seventeenth century Diggers. George Williams analyzes the emergence of Harvard College in the revolutionary society of Puritan New England, the influence of biblical concepts of covenant, community and authority on the structure of the university's polity, and the influence of the doctrine of the prophethood, priesthood, and kingship of believers on the requirements and responsibilities of its teachers. William Butler explores the contributions of V.F. Malinovskii, a pre-revolutionary Russian diplomat and moralist, to the development of a universally acknowledged law of war and peace. The second group of essays treats various contemporary aspects of the interaction of law and religion. James Luther Adams compares and contrasts Ernst Troeltsch's and Harold Berman's ideas and assessments of legal history, particularly the history of natural law theory. Cole Durham outlines a method for analyzing the interaction of religion and criminal law, setting forth and illustrating a variety of types and contexts of such interaction. John Orth demonstrates how John Austin's analytical separation of the divine law and human law -- however well intentioned -- laid the foundation for the late nineteenth and twentieth century legal positivism. Frank Alexander argues that in devising new theories of law, critics of legal positivism must inquire not into the nature of legal rules and legal systems, but into the purposive nature of human individuality and community, and that the theological doctrines of creation, covenant, and redemption offer indispensable insights for this inquiry. Lois Forer demonstrates that judicial cases pose far more trying issues of conscience than is generally assumed and that conventional theories of judicial decision-making offer little guidance to the conscientious judge. Milner Ball argues that the biblical understanding of the Kingdom of God provides a radically different perspective on the interrelation between religion and law and between church and state than is generally taught in America. Thomas Shaffer questions the role of law in a secular society for a religious people, a particular people laying claim to a tradition of caution and prophecy. 2. Institutional History From Archival History; The Court of Canterbury Rolls – Charles Donahue, Jr.
3. The Transformation of Marriage Law in the Lutheran Reformation – John Witte, Jr.
8. Religion and the Criminal Law: Types and Contexts of Interaction – W. Cole Durham, Jr.